Will autonomous trucks transform the supply chain? As the cost of transport reduces as a result of autonomous vehicles, we could see a restructuring of supply chains. The driverless trucks are coming. This is not the premise to an upcoming sci-fi thriller, although the front pages of the UK’s papers have recently led some to believe that this is the start of something very sinister. On the contrary, driverless trucks are likely to have a wide-ranging impact on logistical efficiency that will ultimately reduce the amount of time of takes for exciting new products to reach consumers, and could even – excuse the pun – drive down costs. By late 2018 we should expect to see autonomous trucks being tested on UK motorways, albeit manned for obvious safety reasons. It’s an exciting development for the haulage industry and there are many developments taking place around the adoption of autonomous technologies by newcomers to the industry as well as traditional goods vehicle manufacturers. Rio Tinto is putting autonomous trucks to the test at an iron-ore mine in Australia, quoting a performance improvement of 12 percent. Meanwhile, Volvo is preparing to test a self-driving truck at a mine in Sweden. Mercedes-Benz, Iveco and other manufacturers say that they also have plans for autonomous vehicles yet these will still need a driver. Most commentators say it is unlikely that fully autonomous vehicles will be available until 2030, and take up may be uncertain in a fragmented industry. Those who work with supply chains may assume autonomous vehicles are a long way off, yet developments are taking place that could mean they experience the impact sooner than they expect. Earlier this year, Ocado and Oxbotica trialled unmanned delivery vehicles in the London borough of Greenwich, operating the CargoPod self-driving zero emission delivery van in a residential environment. 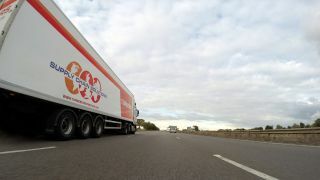 Each truck carried up to 128kg of groceries in eight delivery lockers, delivering orders to over one hundred customers during the trial. Starship Technologies is currently developing and trialling a delivery robot with a three-mile delivery radius. If technologies such as these become widely adopted for final mile deliveries, they could lead to an increasing requirement for fulfilment centres in or near urban areas due to their operating limits, although these could be overcome in the future. Thinking about longer distance work, last year Uber acquired Otto, a self-driving truck start-up, although this is now the subject of a patent infringement lawsuit issued by Waymo. However, this isn’t stopping development, as Uber launched a new truck with more sophisticated LIDOR laser sensors in July 2017. The vehicle still driver assisted, but it’s clear that the ultimate objective is self-guidance. Automating transport on longer distance journeys that use interstate highways and motorways will present fewer challenges than the more unpredictable environment of urban road networks. There should be significant cost savings from autonomous vehicles. Morgan Stanley estimate the potential savings to the US freight transportation industry at $168 billion annually, made up from improved fuel consumption, reduced labour costs, improved productivity and reduced accidents. Interestingly, they believe that autonomous and semi-autonomous driving technology will be adopted far faster in the cargo markets than in passenger markets. Savings would be lower for semi-autonomous vehicles, but still significant. Swedish company Einride, recently launched the T-Pod, an electric self-driving vehicle remotely controlled by drivers. T-Pods are 23 feet long and carry 15 pallets. The remote driver can monitor multiple T-Pods when they are on long distance work, but only a single T-Pod when they are on city roads. When they are inactive and being charged en-route, the drivers will be monitoring vehicles that are in operation. Their ambition is to have 200 T-Pods operating between Gothenburg and Helsingborg by 2020. Einride say there will be cost benefits as well as safety improvements and environmental benefits, but it will be interesting to see how the economics work out. One interesting development known as “platooning” could dramatically reduce the cost of point to point linehaul journeys as vehicles are tethered together electronically and it is this practice that will put to the test on UK motorways late next year. This would make it possible for one driver or crew to control a whole platoon for the long-distance element of a journey, with the convoy being split and multiple drivers completing the last leg. There is currently a trial in Western Australia where the lead truck in a convoy controls the others through vehicle-to-vehicle communication to synchronise speed and braking. Volkswagen Truck and Bus are also carrying out trials of platooning. After initial testing at their site in Sweden, Scania will run a trail in Singapore, where truck platoons of four trucks will cover a distance of ten kilometres on public roads to transport containers between port terminals. The driver of the first truck will set the speed and direction, with the following three vehicles driving autonomously. In Germany, MAN and logistics provider DB Schenker have formed a platooning partnership. They are planning to test platooning under realistic conditions over an extended period of time to gain meaningful data, with a platoon travelling on the A9 motorway between Munich and Nuremberg from 2018. At this stage, each truck in the platoon will have a driver to intervene in case of emergency, but it’s not hard to envisage a single driver controlling the platoon when the technology has been proven and legislation allows. Silicon Valley is backing this concept as well. Earlier this year Peleton, a connected and automated vehicle start-up company, completed a $60m funding round with investors including Omnitracs, Volvo and UPS. Founded in 2011, Peloton say their platooning platform is designed to help fleets of trucks address three of the industry’s major challenges: safety, fuel consumption, and operational efficiency. Research at MIT claimed that savings in fuel consumption through vehicles following in each other’s slipstream could be up to 20 percent, depending on the number of trucks in a convoy, and other studies quote up to 35 percent. But of course, the big cost saving would be with drivers. Drivers may need to be more technically qualified, and therefore paid more, but there would be a need for far fewer of them. The trucks will no doubt be more expensive, but this will be more than offset by other cost savings. Autonomously driving trucks should also generate a surge in capacity with no need for breaks, operating around the clock and maybe never having to return to base. Reduced congestion should also give productivity improvements, contributing to a significant reduction in the cost of transport. Some commentators have remarked that the fragmented nature of the transport sector means that the take up of new technology will be slow due to the need for capital investment. However, this investment requirement could lead to a consolidation of the sector by well capitalised companies – either existing operators or new entrants. As the cost of transport reduces we could see a restructuring of supply chains. The design of a supply chain needs to take into account the relative costs of the different types of transportation, warehousing, production and sourcing. Other things being equal, a reduction in transport costs should lead to fewer, but larger, distribution centres and production plants, although the pressure to have shorter lead times could work against this. The only thing we can be certain of is that a significant shift in one of the cost elements in the supply chain should lead to a reconsideration of supply chain structures.